An environmental group is sending mini packages of black simulated oil to hundreds of random homes in B.C. to show the risks of shipping bitumen in the province. "There's no way to guarantee the safe shipment of diluted bitumen. That's because it sinks in water. 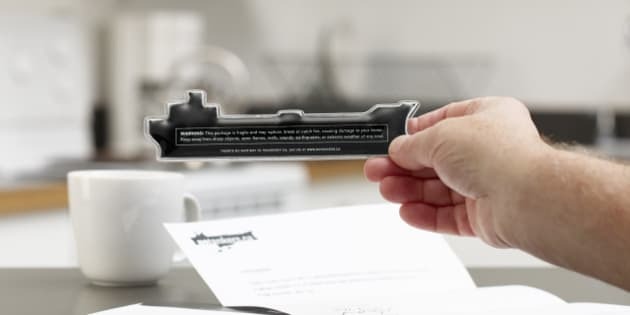 So we've enclosed this sample as a reminder of the environmental and economic risks of bringing more oil tankers to the British Columbia coast." The black substance inside is actually vegetable-based gel with food colouring, the group told The Huffington Post B.C. A disclaimer on the back of the package reads: "WARNING: This package is fragile and may rupture, break or catch fire, causing damage to your home. Keep away from sharp objects, open flames, reefs, islands, earthquakes, or extreme weather of any kind." Currently, activists are protesting a plan by Kinder Morgan to expand its Trans Mountain pipeline. If approved, it would increase the current number of oil tankers it uses from five to 34 per month. Enbridge is also awaiting a final decision on the construction of its Northern Gateway pipeline, which would transport 525,000 barrels of oil from Alberta through northwest B.C. to the port of Kitimat. It would draw about 220 tankers a year. Both projects can carry diluted bitumen, the heavy, molasses-like oil that pipeline opponents say will sink if spilled in the ocean and will be extremely difficult to clean up. That claim is disputed by pipeline project supporters. The mail stunt is part of Dogwood Initiative’s Let BC Vote campaign, which is lobbying for a provincial plebiscite on pipelines. Nagata said if people like the campaign, they'll be able to order samples to send to friends and relatives for a small fee. Earlier this month, the group simulated a catastrophic oil spill on Vancouver's English Bay. Using special binoculars, it set up a scenario of oil fires, bitumen-soaked sand, and a dying orca in the distance.